The Independent columnist Owen Jones occupies a slightly strange position in the political landscape. He has been ranked in various lists as one of the most influential thinkers on the left. He has a reasonably high profile in the broadcast and print media. He’s quite active on social media. Yet his political stance is not one that is leading any debate that I’m aware of. Quite the opposite. The Labour party generally seems to do its utmost to distance itself publicly from the sorts of positions that Jones espouses. That process has gone into overdrive this week in relation to the Labour response to George Osborne’s cuts in social security as part of the Spending Review. The debate between Jones and Simon Danczuk, first on Twitter and then on the Daily Politics a couple of days ago, being the most extraordinary manifestation of this. Whether there is more sympathy for Jones’ stance in private in Ed Miliband’s camp and the shadow front bench have been warned off attacking him, as Dan Hodges suggested in the Telegraph the other day, is impossible to say. That could just be the ultra-Blairite Hodges making mischief for Miliband. Certainly Jones has stated on social media that he doesn’t recognise the situation as described by Hodges. George Osborne and chums must be loving watching Labour tear itself to bits on the seven day wait welfare hand grenade that he lobbed into the debate. Once Ed Balls stated that Labour would consider whether the policy saved money and worked – rather than rejecting it outright as unacceptable in a civilised society, for example – the scope for some serious left on “left” friendly fire was obvious to all. Presumably that is what Osborne was hoping for when he proposed the policy change, alongside the sadistic pleasure of inflicting more misery on the poor. It is clear that Jones is viewed as more of a problem for the Labour party than for the Conservatives. The Conservatives presumably think that Jones is doing them all sorts of favours by publicly challenging the Labour party’s current policy approach of trying to stand a few millimetres to the left of the Conservatives. I met Owen Jones briefly and he was perfectly pleasant in person. But there is something about his public persona that gets up people’s noses. I’ve been reflecting on what it is that makes Jones so annoying to so many people. He’s too shouty. Even when he is making a perfectly reasonable point he’s never far away from ramping it up a notch or two, especially on Question Time. He’s got that whole interrupting, talking over opponents thing going on. This no doubt betokens a passionate belief in his own position, but it is surely off-putting to those who feel that political debate is best conducted in a more civilised fashion. When he gets going I have flashbacks to an occasion where I was shut in a seminar for two days with a member of SWP. Every intervention he made ended up in a spittle-flecked rant accompanied by a lot of feet shuffling and staring at the floor among the other delegates. That approach no doubt works in some circles, but it doesn’t carry over very well to broader public debate. He’s backward looking. Much of what Jones advocates represents relatively conventional social democratic and socialist measures. There are some who would no doubt therefore dismiss this as old-fashioned and failed policy. The “failed” part of that is at the very least debatable. The “old-fashioned” part of it seems beside the point. To take a policy from another part of the political spectrum, free trade has been strongly advocated as a policy position since the early nineteenth century, but there are few contemporary politicians who would therefore write it off as no longer relevant or appropriate. He’s inauthentic. On the Daily Politics Danczuk utterly failed to engage with the points that Jones was making about the seven day delay in access to JSA. To the extent that he addressed policy substance at all he attacked a series of straw men. He continues in a similar vein in today’s Times. But more egregiously he engaged in some rather crass ad hominem attacks. He suggested that Jones cannot speak on issues relating to benefits, social security and the plight of the poor because he comes from a privileged background. To the best of my knowledge Jones doesn’t come from a hugely privileged background, although he did study at Oxford. But even if he did then that shouldn’t necessarily be problematic. This sort of ad hominem approach seems part of a more general trend towards the valuing of “authenticity” over empathy or sympathy. Significant social and policy change often requires the backing of a broad coalition. Almost inevitably some of those supporting it will not have direct experience of the problem or benefit from the change proposed: they support it because they believe it to be right. If their support and advocacy is rejected for lack of authenticity then that significantly impedes the likelihood of the desired change occurring. He’s too idealistic. Or unrealistic. Or simplistic. Depending on your point of view. Even if we were all to agree that the state of the world described by Jones is more desirable than the one that we are currently experiencing, he’s rather short on details about how to get from the current mess to where he’d like us to be. That can mean that he’s emphatic when nuance is required. Some things are simple and have a simple solution. Most things are complicated and the solution is rather less obvious. I don’t think that sort of argument can be applied to the debate over changes in access to JSA. All Jones is arguing there is that it would be better to leave things as they are and not leave unemployed people without income for seven days – or up to five weeks under Universal Credit – because that has all sorts of negative consequences. But I think that some of the policies he has advocated need to be fleshed out more fully to be credible. For example, there is a strong argument that cutting the Housing Benefit bill is only going to be achieved if more low-cost rental housing is built. That is probably the majority view among housing commentators. It doesn’t necessarily have to be council housing, as Jones advocates, but it could be. But the challenge is how to find the money to build while still paying the Housing Benefit to keep households in their homes. You have to pay twice in the short term in order to reap the benefits in the longer term. The only options are borrow more and/or cut spending elsewhere. That is the harder part of the argument to make and make credibly. And it is the harder part to make credibly if the answer to all problems is to borrow more. He doesn’t speak for any meaningful part of the electorate. So why does he get the air time? I think that may be true – in the sense that he doesn’t speak for many of those who will turn out to vote. But that says much about the sickness of our political system. It could be credibly argued that, in contrast, he speaks for many of those who have given up on voting because none of the centre-right/right parties that we currently have offer anything they feel they can support. He reminds Labour of what they used to stand for. It is interesting that in Danczuk’s Times article today he refers back to the 1983 Labour party manifesto – famously described as the longest suicide note in history. This reference is presumably supposed to set all sorts of alarm bells ringing and warn everyone away from what he describes as “the siren voices of the futile Left”. The analogy with the 1983 manifesto hardly justifies any serious consideration. Today’s Labour party bears no resemblance to Michael Foot’s party. Indeed, if we had enough time we could probably construct a plausible argument that today’s Labour party is to the right of the Conservative party circa Ted Heath, if not John Major. But more importantly, the terrain Jones and others like him are seeking to engage the Labour party on at the moment is not unilateral nuclear disarmament, widespread renationalisation of the commanding heights of industry, or the outlawing of private landlordism. They are arguing that by cleaving to the positions almost indistinguishable from the Conservatives on issues such as social security, immigration, law and order the whole idea of social democratic politics which values individuals, rights, and human dignity is in danger of being thrown out of the window. As Labour bends to the will of corporate power, the financialised economy, and triangulation against public opinion that is refracted through a feral right wing press it is cornered into a political calculation that removes the rationale for its existence. That seems fair point to me. We live in an increasingly right wing society in which mildly social democratic proposals rooted in empathy and care for the vulnerable can be dismissed as dangerous socialism. Owen Jones has a following. There are people ever ready to leap to his defence. I don’t see myself especially as a supporter, and I don’t feel he always does himself any favours when trying to make his case, but I think it is good that the sort of views he espouses are part of current political debate. If nothing else, they remind us – those of us old enough to remember – what the world used to be like; of the territory upon which political debate used to occur. And, if we were optimistic, we might think that if things have travelled so far in one lifetime it is not impossible for them to travel back the other way. We might hope that at some point people finally realise that a world founded on individualism and self-reliance is unpleasant for the many, not the few, and is ultimately incompatible with dignity for all. We need to move beyond talk of dependence versus independence and recognise that we are inter-dependent. And that there is such a thing as society. Image: Veggiesosage via Flickr.com under Creative Commons. Appears to me that Owen Jones is carving a brand of socio-political debates tailored for the working man’s ears. He shows the glaring chasm between conventional politics banter of the posher parts of society and the guy on the street. He’s brash, obviously passionate, cheeky and at times a bit verging on taking the piss. However, a sea change in politics is vital and Owen Jones appears to be a part of that. Let new and more inclusive social justice debaters emerge. Huh, as an actual working-class person I don’t feel that he speaks to me, or for me, at all. Rather he presents a patronising, romanticised caricature of the poor, downtrodden masses. As i said i think he is a bit of a ‘brand’ and used by the media as news is released in a timed and staged way. I like some of his articles like i remember one on a man’s suicide at a train platform. He writes thoughtfully and astutely and highly intelligent in his own right. I agree that i don’t think he actually does raise sentiments of working classes and doesn’t have gritty forceful clout and driving passion like someone like the late Bob Crowe could give. It’s the height of foolishness for anyone in the Labour party to be waving around the “you can’t advocate for the poor unless you’re poor” nonsense. How does Danczuk expect to justify even millimetres of difference from the Tory position while accepting that kind of critique? Having read his article in the Independent yesterday, Melbourne’s remark about Macaulay came to mind – I wish I was as cocksure of anything as Tom Macaulay is of everything. the guy is obnoxious and loves the like of his own voice and opinions – hes stuck up too. You’d have to know him personally, to know both claims for sure. I have read this a few months later than it was originally written but I find it all a bit patronising. I don’t know what your background is nor do I know the background ofOwen ones – so why do I feel that you are looking down your nose at him? Why do I feel that you resent the fact that he was educated at Oxford? I agree with some of your points about him being his own worst enemy on TV confrontations. But I do not find him annoying. I find his opinions a breath of fresh air. Your nonsense about him looking backwards and living in the past is just your dismissive way of trying to put down what he says. It s much easier for your to paint him as Old Labour and condemn him as if he were ‘out of date’ rather than actually respond with a well thought out argument. A Blairite lazy man’s approach to debate. 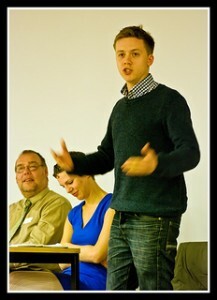 Owen Jones has been saying things and providing an analysis of today’s politics which is not fashionable. He does not churn out the same bland, comfortable, middle-class pap that is so much in evidence in the Westminster Bubble. Thank goodness for Owen Jones. @John Tilley – thank you for your comment, but I’m not sure that you read what I wrote very closely. My post is trying to diagnose why many people find Owen Jones annoying. It doesn’t say whether I find him annoying. I don’t disagree with much of what you say, except inasmuch as you direct your criticism at me rather than at those who dismiss Jones in the way I suggested. I am often guilty of misreading or not reading carefully enough. Maybe I did not fully understand your point. Or maybe I detected an unspoken attitude in the way that you wrote rather than what you wrote. So you’ve made a flawed analysis of the piece, were corrected with the authors full grace and humility, but you are sticking to your guns. Owen would be proud of you. Not guilty. I actually said that I may have misread or misunderstood. Since making my comment I watched Owen Jones’ Royal Television Society Lecture (broadcast on BBC FOUR on Sunday) and once again he managed to be a breath of fresh air. I would recommend it. For anyone engaged in public political debate, one must look old enough to possess some life experience. Unfortunately for Owen Jones, he looks about 12 years old – and a very earnest 12-year old at that! – even though he’s probably in his forties. He’ll come across far less annoyingly when he looks like he’s reached his thirties (which should occur when he reaches his sixties). Nah, he’s pretty much wrong. Yes, it would be fair to say that the political landscape has changed beyond recognition in the intervening period! I think Danczuk was mirroring Ownes’ own ridiculous comments on news show. He got all pissy and whiney and basically said that people who were not gay, couldn’t understand or speak on the subject of the Orlando shooting. He was so obnoxious, I bet they were wishing him to eff off. There was non-visible sigh of relief, shall we say figurative sigh of relief?